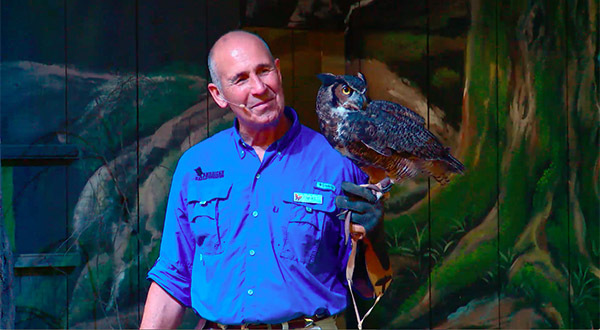 Mike gives the audience an up close look at Owlice the Great Horned Owl. Karen and Dolly the Red tailed hawk explain how raptors are excellent rodent control experts. Kayla brings Tyson the Screech Owl out on stage. 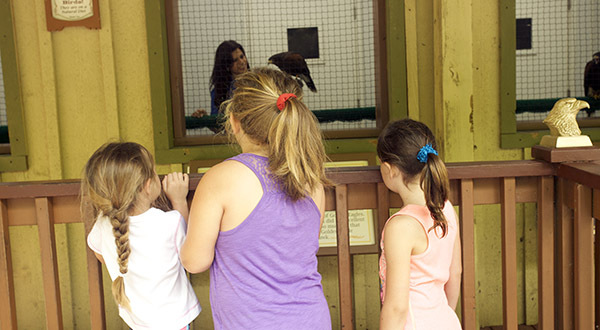 Between shows, guests can view show birds in their mews. Katelyn holds Victory the Golden Eagle as she shows off her impressive wingspan! Beth and Bonita explain that birds of prey CAN see in color! Madison shows off Aleda the American kestral. Christian holds Mike the Harris hawk. Mikie was raised by Golden Eagles! Mike and Spirit share the story of the comeback of the Bald Eagle. After the show, Friar Tuck takes donations for his Eagle friends! 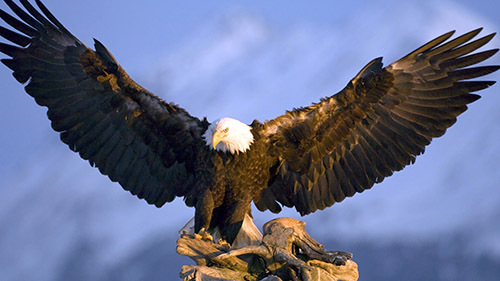 After the show, guests can visit the Eagles Nest Gift Shop and help support the AEF. 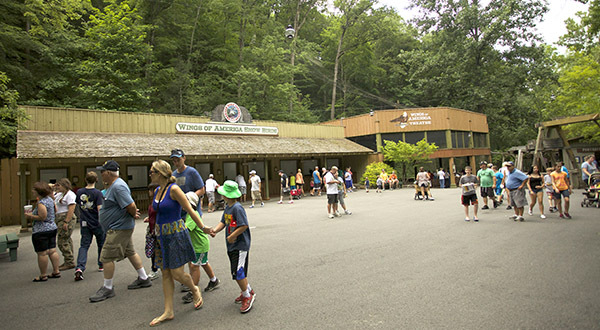 The AEF educates more than 100,000 Dollywood guests annually. 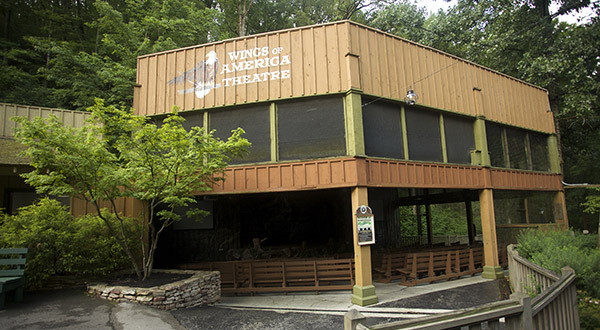 The Wings of America theatre is an open air venue that seats more than 300 guests! The American Eagle Foundation’s spectacular Wings of America birds of prey show is presented in an open-air theater located at Dollywood family theme park. It features an up-close look at eagles, hawks, falcons, owls and vultures—some in dramatic free-flying form. 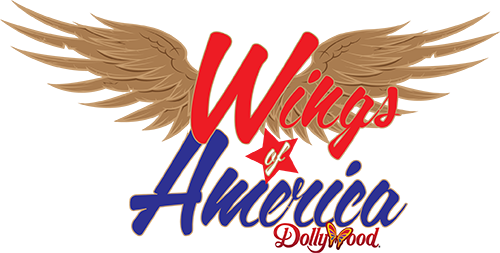 You can enjoy the Wings of American birds of prey show at Dollywood on any normal park operating day between Grand Opening day which typically occurs mid-March and October 31st of each year. After October 31st, all of our show birds return to our off-park headquarters for the winter until shows start back up in the spring. 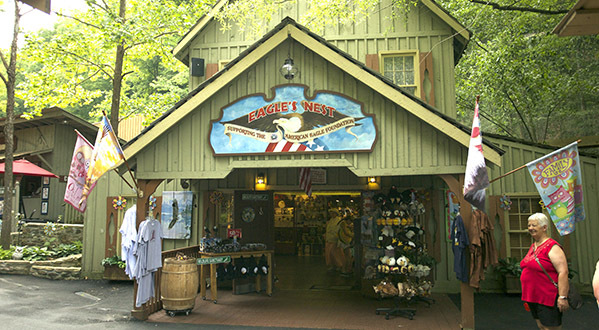 Once the show is over, guests can visit the AEF’s Eagle’s Nest gift shop next to the theater, where all proceeds benefit the mission of the American Eagle Foundation.